Some White Pikmin plucking a patch of nectar weed. Since this subject has no official name, the name Nectar weed is conjectural. To do: Try using Dolphin and savestates to see if a leaf giving out nectar is determined via chance, at the moment of pluck, or if each patch has a specific random amount it can give. Nectar weed is found in a number of overground areas in the first two Pikmin games, and resembles a patch of long grass. Its purpose for Pikmin is as a source of nectar: they can extract pools of nectar from it seemingly by plucking out single leaves of grass. Unlike eggs, these will only ever contain nectar, not spray drops. The amount of nectar contained inside a patch is random, and it is possible to have no drops of nectar appear. Only five Pikmin can be pulling a patch of nectar weed at a time. There is no need to swarm the Pikmin to the patch, as they will attempt to use it whenever they walk near it. Given how mundane and camouflaged these leaves of grass are, it is likely that Pikmin were programmed to interact with them without the player's consent. 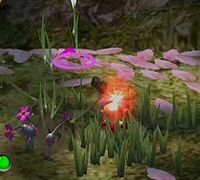 Otherwise, the player would only realize that this particular type of grass is useful by pure accident, in the chance that they were to accidentally command a Pikmin over a patch of the plant. This does however have the drawback of distracting Pikmin when the player doesn't want it. Ideally, it is best to have five flower Pikmin work on the leaves, and, with all leaf and bud Pikmin, use group swarming to keep the Pikmin in a tight circle around the patch of grass. By using an overhead camera angle, it's possible to get a better view on the location of the newly-uncovered nectar drops. Nectar weed can be found in every area of Pikmin, but only in the Awakening Wood and Perplexing Pool in Pikmin 2, and never underground. It should be noted that in Pikmin 2, Purple Pikmin appear to stomp in mid-air, if thrown above a patch of nectar weed. Two patches in the base. There are two patches in the landing clearing. One patch on a ledge by where the player finds the Yellow Onion. One by the Armored Cannon Beetle. One by a Burrowing Snagret. There is one east of the base. A patch before the bridges. One by the bridge to the area with the Fiery Blowhog. A few by the Breadbug base. Two patches by the base. One by the maze that leads to the UV Lamp. One by the Shearwigs near the Pilot's Seat. A few patches by the Emperor Bulblax arena. The only nectar weed is between the Ship and the Dandelion on the ledge near the Pilgrim Bulb's resting place. On the peninsula near the drainable lake. Pikmin that carry the Onion Replica and the corpses from the area behind the ship go on this peninsula. Very close to the Yellow Pikmin Onion. It's between three Fiddlehead plants, and a couple of Dandelions are nearby. Captain Olimar near a pile of rubble on the Wistful Wild. Since this subject has no official name, the name Rubble is conjectural. Rubble is found in small piles in the first two Pikmin games, and its use is exactly the same as that of the nectar weed. When Pikmin pass over a stockpile of rubble, whether directed to by the leader in charge or not, they will begin attacking the pebbles, causing them to randomly give out pools of nectar, until all pebbles have been destroyed. Unlike nectar weed, rubble is fairly rare, appearing only in three areas and in very limited quantities in the first game, and only in two overworld locations in Pikmin 2. There is no rubble in The Impact Site. There is a patch near the Shock Absorber. There are two patches near the landing area, one behind the white bramble gate and the other is near a few Pellet Posies. There is a patch near the Puffy Blowhog and Spotty Bulbear closest to the landing site. There is no rubble at The Final Trial. One compound is straight across an open area from the landing site, on top of a stone ledge. It is near the wooden spire which holds the Impediment Scourge. The wild Yellow Pikmin Onion area is located just northwest of this. Another place that has rubble is the area between Submerged Castle and the stone foundation which has the Massage Girdle perched on it. This is in shallow water, so only Blue Pikmin may harvest it for nectar. A pile of rubble is on the uplifted "ring" behind the landing site. Another stockpile of rubble is between Cavern of Chaos and the landing site, next to Doomsday Apparatus. The Cavern of Chaos is behind a rusted wall. A patch of nectar weed in the Perplexing Pool. A patch of nectar weed in Pikmin. A pile of rubble in Pikmin. This page was last edited on October 27, 2018, at 13:48.